Just a short train ride from bustling Kuala Lumpur, Malaysia are the Batu Caves. 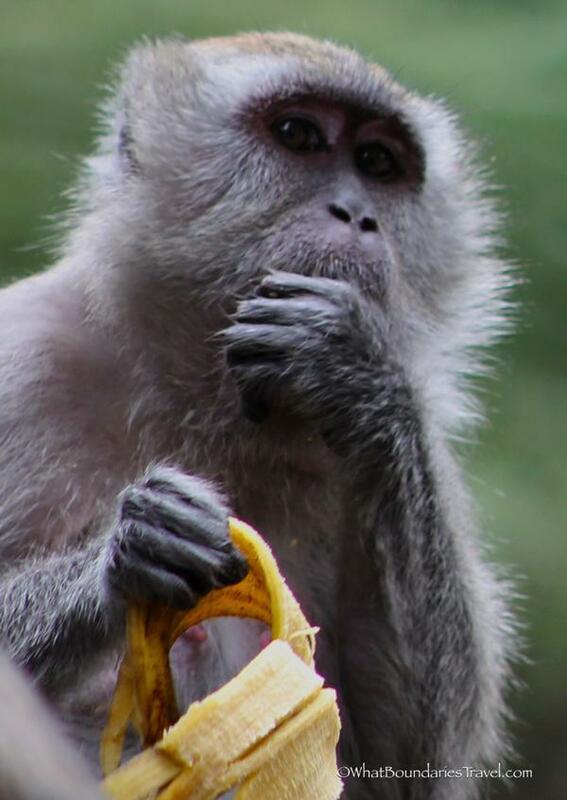 Known mainly for their significance as a Hindu holy shrine dedicated to Lord Murugan, this popular tourist destination is also the home of a troop of very cheeky Batu Caves monkeys! The caves themselves are said to be around 400 million years old and the local people believe the symbols can be traced back to the earliest indigenous Temaun tribe. There are 3 main caves that can only be reached by a climb up 272 steep stairs. However, the view inside the caves is worth the trek! 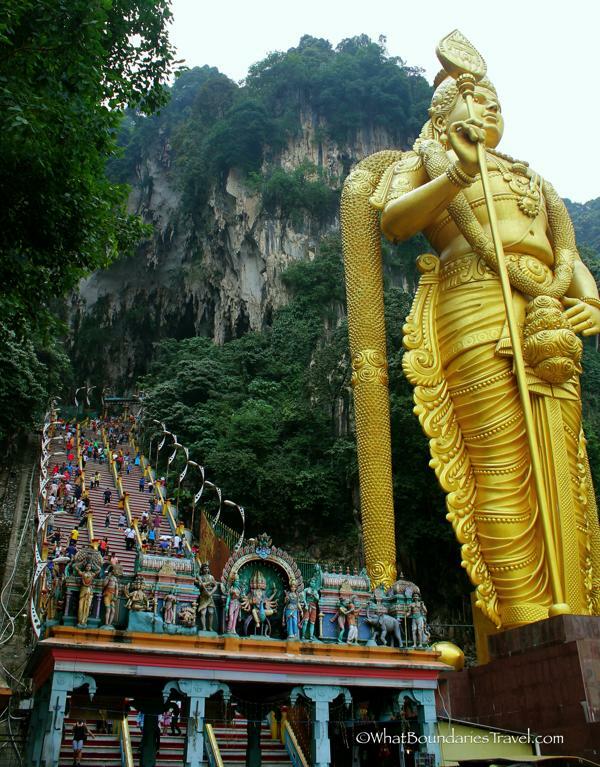 Outside the Batu Caves, standing at 42.7 m (140 ft) high is the world’s tallest statue of Lord Murugan, a Hindu deity. The statue, which cost approximately 24 million rupees, is made of 1550 cubic meters of concrete, 250 tons of steel bars and 300 liters of gold paint brought in from neighboring Thailand. Very impressive indeed! 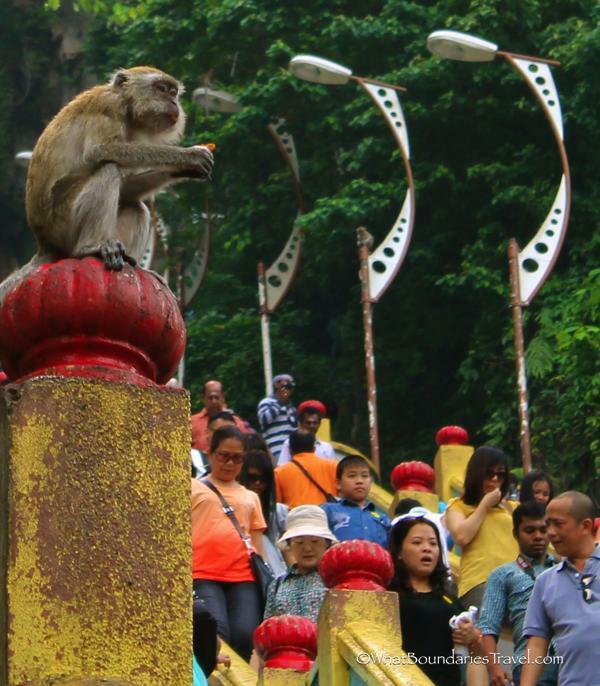 The Batu Caves Monkeys Steal the Show – and Your Sunglasses! But in spite of all of the religious splendor on display, on our visit to the caves, the macaque monkeys stole the show. They were everywhere – darting in among unsuspecting tourists and worshipers alike – with no respect for either cameras or prayers. Eyeglasses were unceremoniously ripped off of heads and flung high into the trees to an awaiting accomplice. Women’s handbags were ransacked with agility that would make a New York pickpocket envious. Cans of soda were plucked from surprised children’s sticky fingers and gulped down before the little one could even begin to bellow. Pilgrims struggling up the steeply pitched steps would suddenly find their way blocked by a large, furry body with a nasty snarl demanding his share of whatever was in bag or pockets. While Cheryl made the climb, I elected to stay down and take a few pictures of these evil entertainers who were so obviously using us humans to relieve their boredom. Beautiful necklaces strung with fresh flowers were gleefully shredded over the heads of worshipers as they tried to enter the temple. Shoes, taken off in reverence for the site, were haphazardly tossed and rearranged by the younger monkey set. Sitting high overhead on the entrance way, one particularly demonic fella would casually await his next victim and toss pieces of half-eaten orange on their heads. Then, when a scream or shout was elicited, he would scamper around grinning as though he had won the monkey lottery! 1. Keep all of your bags tightly zipped and have nothing in your pockets that you would be upset if a monkey took and ran away with. 2. If you wear glasses or sunglasses, a neck tether is a good idea. 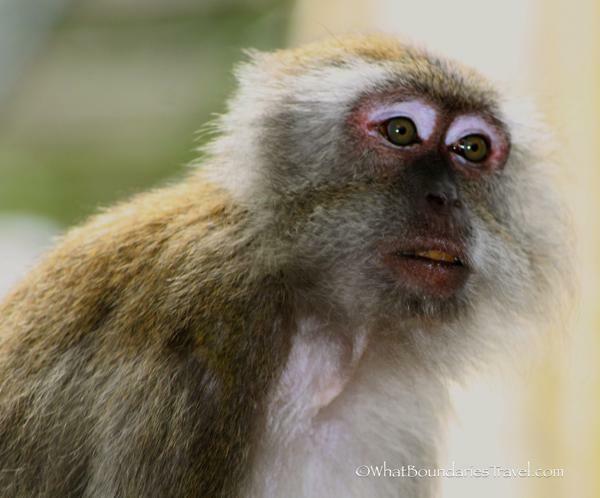 Keeping your eyes open to be aware of the monkeys is an even better idea. They seem to prey on those who don’t make eye contact. 3. Hold cameras close and use a neck strap if you have one. These guys are very curious and it doesn’t matter to them if the camera cost $25 or $2500. 4. Don’t feed them! 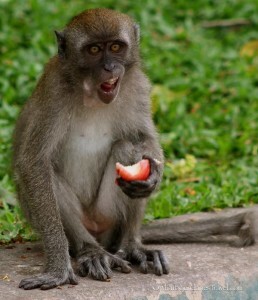 We saw so many tourists handing out food and then acting outraged when the monkey aggressively came back for more. 5. Enjoy them…from a distance. These are wild animals. Really. We’re monkey lovers. But you’re right. These little rascals are wild creatures, and people shouldn’t feed them or encourage them to come close. Luv the pic of the baby monkey! Thanks! 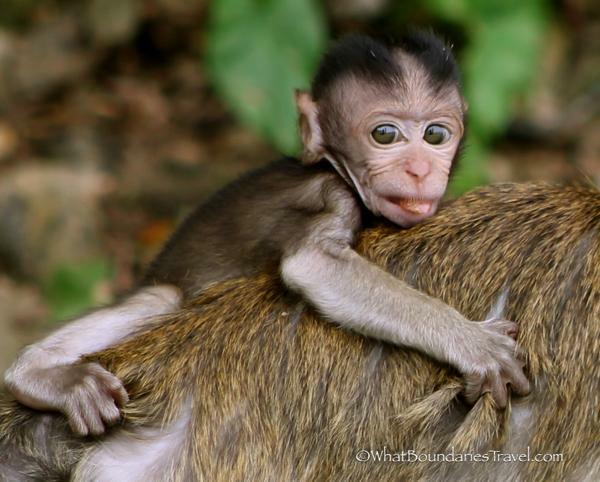 Lisa loved taking photos of the baby monkeys – it is fun to watch them learn to interact with the rest of the group. Picking up bad habits I am sure! I have a bit of a love hate relationship with these little guys. I have taken some great photos of them over the years, but really don’t like spending that much time around them. I had one grab my water bottle one time when I was at Monkey Forest in Bali. He opened the bottle, took a drink and threw it away in disgust when he realized it was only water. It was funny to watch! I think the most entertaining moment was when a monkey grabbed the bottle of 7-up in the above photo. His first attempt at getting into it was to bite straight into the can which began to pop and fizz shooting soda everywhere! Scared the little guy, but not enough that he did not come back for the rest of his treasure! We were there years ago and although it wasn’t very crowded with people the day we visited the monkeys were everywhere and were relentless! Good tips! 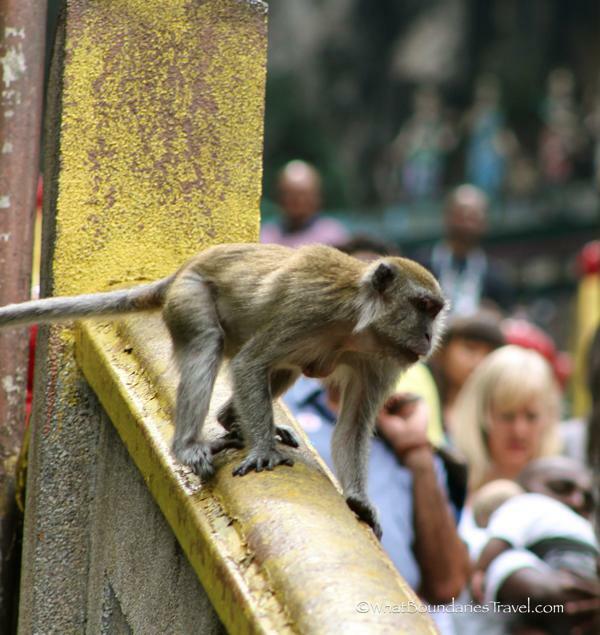 We noticed the monkeys seems to time their arrival with the trains arrival – like clockwork. New train, new set of tourists to torment! Thanks guys – it was well worth the trip from KL and so easy! The train literally drops you at the front entrance to the Batu Caves. Enjoy your visit and safe travels.